Dosa is a typical dish in South Indian cuisine, eaten for breakfast or dinner, and is rich in carbohydrates and protein.Here's my mom's awesome masala dosa recipe !! Soak Urad dal, rice, methi seeds and sago with enough water overnight. Grind the soaked ingredients with enough water to a smooth paste in a grinder;Make sure the batter is not too watery! Allow the batter to ferment in a warm place for about 8-10 hours; Make sure the container has enough room for the batter to rise else the batter will overflow due to fermentation! Place a non stick Tava on medium heat.Once hot, pour a ladle full of batter at the center; With the back of the ladle, spread the batter thinly; Start from the center and work outwards, in a fast circular motion; Note: Spread the batter as soon as you pour it on the tava; The batter will start getting cooked other wise and stick to the tava and makes it difficult to spread the batter evenly! Pour few drops of ghee/oil all over the dosa and also at the edges; Let cook on medium heat until it turns golden brown in color. 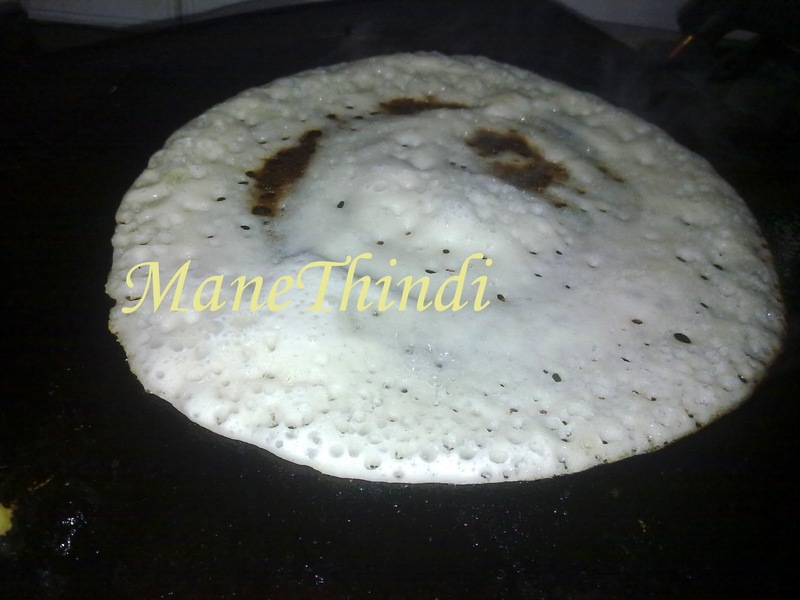 Add 1 ladle of masala/palya (see below for recipe)prepared to the dosa and fold the dosa as shown in the image. 4 medium sized Potatoes - Pressure cooked, peeled and mashed coarsely. Add oil on to the heated saucepan. Temper with mustard seeds, curry leaves, dal mixture, turmeric, ginger and green chilies. Add chopped onions and fry until golden brown. Add mashed potatoes, salt and mix well. Add lime juice, coriander leaves and mix well; Keep aside. Fry 6-8 medium spiced chilles,a handful of pudina leaves,2 stands of coriander leaves,1 strand of curry leaves,1 inch ginger,a pinch of asafoetida in little oil tempered with little asafoetida and mustard seeds. Grind the above after adding 1/2 cup grated coconut,3 tsp hurigadale/dalia split and salt. Chutney is ready to be served with masala dosa! Note:Same dosa batter can be used for plain dosa also.